We're all busy adults with busy lives (pets, family, kids, jobs, etc) but there comes a point where we have to say, "Seriously, Let's Play!" As an extension of this idea the podcast Seriously, Let's Play was launched as a joint venture by both Passionerdly.com and our producers at The Nerd's Domain. This new podcast will be issued by Southgate Media Design and feature John Thompson (from Dice Voyeurs and Tome Travelers), Matt Quiett (from Masks of Nyarlothotep, Kickstart This, Nerd's Domain and More), and John Quiett (The B Team for Masks of Nyarlothotep) stepping into the seats of GM for several one-shot RPG games where each season will feature various themes. Allow me to introduce you to a few of the games that will take place as a part of our contribution for it's first season! Let's start off with Tokyo Brain Pop! One of the Old-School-Japanese-Culture-Games; John has run Tokyo Brain Pop several times over the years in his own non-standard tradition featuring elements of social party gaming. This time he held the game at a table in Shreveport, Louisiana for his wife's family. At the table we had three generations of gamers including: Bobbie (she started playing RPGs in the 70's peeps! ), Amanda, Levi, David, and Roxy! 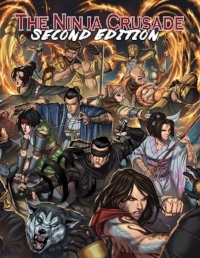 Our other game for this first season of Seriously, Let's Play will be Third Eye Games' Ninja Crusade 2nd Edition! Our bigger contribution to this season, this is one of John's favorite games and he has backed it and it's various expansions on Kickstarter. For this game, we will be joined in Houston, Texas by Kevin, Chelsea, Roxy, David, and Kristi! The big announcements don't end there! We had such fun with the Ninja Crusade 2nd Edition Table that we will be starting up a Ninja Crusade 2nd Edition Actual Play called The Wooden Dojo! Be sure to watch for it when it comes out!